Antonio Citterio, Ron Arad, Vico Magistretti, Anna Castelli Ferrieri, Alberto Meda, Joe Colombo, among others – the Italian Company Kartell has cooperated with the international design-scene Who-is-Who for the new products from 2011. 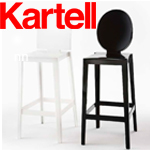 As many other manufacturers do, also Kartell presents its new products just in time to the Milan Furniture Fair in April. A total of 15 new products should expand the previous Kartell catalogue limits and research as well as establish new materials. There is no way around the recently named Designer of the year 2011 Tokujin Yoshioka: with “The Invisibles” Light he expands his collection from 2010 with a range of weightless and dynamic tables, brackets for equipment and benches. The new pieces of furniture with their square and elegant forms seem to escape from the material world and act as if they were floating on air. Kartell uses the industrial cast-technique for the manufacturing of The Invisibles with moulds that tolerates weights and measures out of the norm, and thereby guarantying the furniture’s stability. The result absolutely corresponds the Kartell style, the trademark that proves and perfections the “transparent furniture” concept since more than a decade. Also the star designers Philippe Starck and Eugeni Quitllet have cooperated with Kartell in 2011 once again. With “Miss Less” both of them present an unusual chair and enlarge the beloved Ghost-Family with the stool “One More, One More Please”. Furthermore the designers have created an armchair and a sofa that include bevelled pockets in their armrests with “Magic Hole”. With “King Top” Starck and Quitllet did also design a table. With Poltrona 4801, Kartell pays tribute to one of the absolute classics of the own museum and re-designed the originally by Joe Colombo created armchair that is an authenticdesign-symbol of the 60es and that is extremely desired on auctions for ancient furniture pieces today. The modern industry-technique allows manufacturing the classic products out of transparent plastic; this emphasizes their round, soft forms. With Oyster and Zooom, Mario Bellini and Piero Lissoni present two tables for Kartell. Lissoni moreover adds the Audrey chair series. Audrey is a versatile and modern chair that is weightless and stabile thanks to its die-casting-aluminium-made frame, so that its one-piece structure acts robust and light. Foliage is a sofa from Patricia Urquiola that definitely shows the designer’s graphic hand. With the Comeback Chair Urquiola furthermore designed a new interpretation of a great Kartell classic and offers a new look to the Windsor Chair. The used plastic material and the selectable vivid colours give weightlessly and modernity to the Comeback Chair. Also lamps are represented among the Kartell novelties: Bloom is a flowery pendant lamp and Taj a table lamp from Ferruccio Laviani. With Matelasse’ Patricia Urquiola moreover presents a range of colourful vases in three different sizes with bevelled structure. Fabio Novembre shaped a decoration Element out of polycarbonate with “OK”. 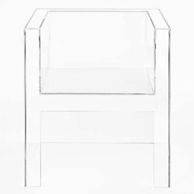 Sundial is the only new shelf in the Kartell assortment. This one has been designed by Nendo. Find further information about the Kartell novelties and the presentation of the company on the Milan Furniture Fair on the company’s homepage.